Net premium revenue increased by 12% to a total of $17.41 billion compared to $15.61 billion last year. Net Investment Income declined to $8.96 billion from $10.05 billion in 2016, an 11% decline. Fees and other revenue increased 19% to $3.99 billion from $3.34 billion in 2016. Benefits and Expenses totaled $23.60 billion for the period, a slight decline of 0.3% from $23.67 billion, while for the second quarter Benefits and Expenses were down 10% to close at $11.11 billion relative to $12.28 billion in 2016. This was mainly driven by increases in commission and related expense and administration expenses and a decline in Changes in insurance and annuity liabilities. Commission and related expenses grew by 15% to $2.38 billion from $2.07 billion while administration expenses increased by 31% to $9.27 billion (2016:$7.1 billion). The company highlighted that “the increases were influenced by business expansion – in particular the Cards and Payments business.” Changes in insurance and annuity liabilities decline by 86% to total $465.34 million relative to $3.26 billion in 2016. Share of profit from joint venture amounted to $16.53 million relative to $10.96 million a year prior. Share of profit from associate for the period totaled $233.13 million compared to $329.43 million last year. As such, Profit before Taxation amounted to $7.01 billion, a 24% gain when compared to the $5.67 billion booked in 2016. Investment and corporation taxes of $1.35 billion was reported for the period (2016: $1.37 billion), as such net profit for the six months totaled $5.65 billion (2016:$4.31 billion), an increase of 31%. 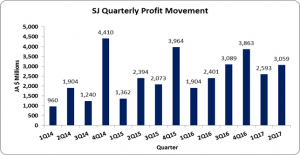 Profit for the quarter amounted to $3.06 billion relative to $2.40 billion in 2016. Earnings per share for the quarter amounted to $0.783 (2016:$0.615), while EPS for the period totaled $1.45 relative $1.10 in 2016. The twelve month trailing EPS amounted to $3.22. Total Assets increased by 6% or $17.80 billion to close at $340.21 billion as at June 30, 2017 from $322.40 billion the year prior. Equity attributable to stockholders of the company as at June 30, 2017 stood at $59.82 billion (2016: $51.69 billion) resulting in book value per share of $15.32 (2016: $13.23). The number of shares used in our calculations amounted to 3,905,634,918 units.